Automatic Bitcoin price channel prediction. Support and resistance levels. Updated hourly. My friend built a thing to move USD on and off any exchange. 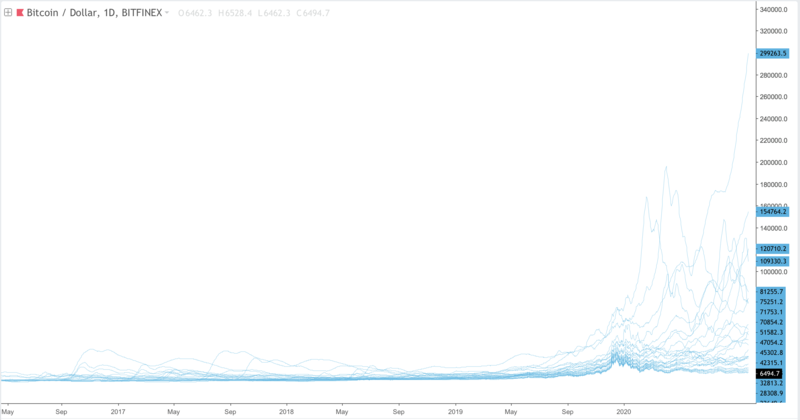 The average daily volume line reached it’s lowest point of the year yesterday (Bitstamp/Bitfinix). Everything is now moving into the breakdown/breakup area very nicely indeed. The average descending triangle breaks at around 65% to apex with the very biggest breaks occurring after 80%. – 80% is October 20th. Suffice it to say we really are in the zone now for some form of resolution, be it down or up. Plus there is a buying Bot 0,003 working hard every 6 Seconds. BTCUSD has been a little bit boring after the drop on the 5th of September. 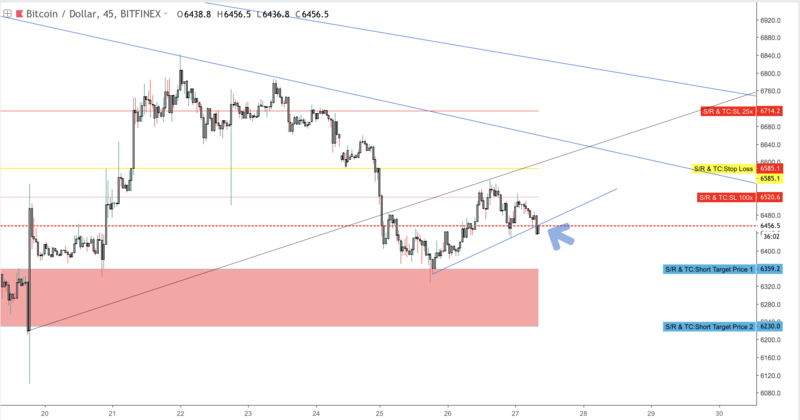 Resistance levels mentioned in my previous report came into play and the market did not have the momentum to beat the $6800 level, after which prices retreated to previous support at $6400. Lets take a look at the [Bitcoin 1 Day candle chart](https://cryptosignals.trade/forums/topic/bitcoin-btc-price-analysis-september-2018/#post-18204). We can clearly see the attempt to break resistance, but clear consolidation below resistance bringing us back to a bearish scenario on the shorter term. Both momentum indicators confirm the current bearish pressure in the Bitcoin market, with Ripple and Bitcoin Cash currently outperforming Bitcoin, it will be a interesting days ahead. This is a picture that we have seen a lot with Bitcoin over the years, typical in crypto after very big pumps and dumps. Typical to a market finding its equilibrium before further growth. I am not so concerned about Bitcoin or Crypto crashing, get involved in projects, enjoy being a part of the space. This is on the weekly. Tbh it looks like this bear market might be over. Hopefully getting in early for the breakdown of this trend line. 2% stops and 1.5-3.5% profit targets. If you had to set up a countdown for the breakout of this large trianlge, how would you set it? I am still of the opinion that yesterday’s 6350 price was a possible ‘low’. Since the jump from there the MACD has crossed on the 4H. 1H Stoch RSI has sort of reset, but this is not a very reliable indicator to me. The hourly pattern is a bit of a mess, but the 6350 shows a miniature inverse H&S, which jumped to 6550, and it’s currently losing some steam. However, it looks to be forming a falling wedge. So I have a stop loss set at 6400, for my long which I opened at 6420. I have been getting more bullish after recent ~~lower~~ higher lows, but I could see the price testing the upper triangle trend line ($6880-6950ish for me) again. Edit: thought I was responding to /u/enjoythesun, but posted it as a separate comment by accident sorry. Does anyone see any patterns forming on the hourly chart? Also it really seems like this sub is split on us breaking up or down the giant meme triangle/wedge. Ugh. My guess is they shorted into all the pumps since April and now closing in profit. Hopefully next time they go long and pump it. I need a lot more random walks, but here’s my version of an MCS of BTCUSD through 2020. So any of you guys planning to invest in Bitmain?